Life's too short not to have fun! Enjoy the simple things -- like a duck in the tub! 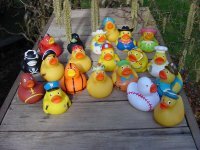 Many Ducks to chose from. Looking for a specific one just ask.